Here is the next installment of the "Scent of the Day Challenge" Rebecca from Hello Pretty Bird created. Day 11: Flowerbomb by Viktor & Rolf -- I liked this one but didn't love it. It's a nice, warm scent. Day 12: Narciso Rodriguez For Her -- A very warm floral that I like, although I may have over sprayed it and given myself a bit of a headache. It is quite sophisticated. Day 13: Burberry Body -- I was kind of "meh" on Burberry Body Tender, but this one I really like. Like I want a full-size bottle like. The dry down scent is warm and sensual. Day 14: Tory Burch -- To me, this is a crisp, fruity floral that dries to a soft floral, and I liked it. Day 15: Thierry Mugler Alien -- This one seemed fruity but warm, and was quite interesting. I wasn't sure about the scent right after I sprayed it (the mix of top notes, I guess), but I did like how it dried. Day 16: Cartier Declaration -- So, I put this one on and immediately thought I had made a mistake and was trying a men's fragrance. Well, I looked it up on the Sephora site, and discovered it was "Created for men, but also enjoyed by women". It is very warm and spicy, but not overly masculine. Really not a scent for me, though. Day 17: Downtown by Calvin Klein -- I didn't really like this one. The card that has the vial attached to it says " fresh florals and aromatic woods", and it seems like a complex fragrance. It had completely disappeared on me by the end of the day. Day 18: Versace Yellow Diamond -- I liked this one, but it didn't blow me away or anything. It reminded me of Lancome's Miracle (which is a staple in my fragrance wardrobe), but I don't like it as much. It is a fruity floral to my nose. Day 19: Vera Wang Preppy Princess -- I like this perfume quite a bit, but the name and marketing put me off. The card says it's a "luscious, woody fruity fragrance." Day 20: Gucci Première -- Another one I really like. I put it on and actually said out loud "Whoa. This is nice." It seems sensual and warm. It says on the card it is woody and musky. Day 21: Marchesa -- This is quite a feminine perfume. It smelled kind of powdery to me, and I did like it. It also lasted all day on me. So there are days 11-21. I am really enjoying this challenge (which is actually encouraging me to use the samples I have accumulated), and I have discovered some new fragrances to put on my wishlist. Favorites for the week: Burberry Body and Gucci Première. What, you don't want to be a preppy princess? :P I still have yet to try Flowerbomb but I want to. Warm + flowers sounds like a thing I might like. Preppy princess so totally describes me. Actually, Flowerbomb and Katy Perry's Killer Queen seem kind of similar. Both very nice. I wore Flowerbomb on my wedding day. Brings me back every time. :) I've been lusting over Alien for a long while, too but it's just so spendy! I love how a scent can evoke memories. And memories of other people. The bottle for Alien looks like a piece of art (all Mugler fragrances do, in my opinion). Perhaps a special occasion is coming up and Alien would make a nice gift idea??? Narciso Rodriguez For Her made me feel all grown up while I was wearing it. 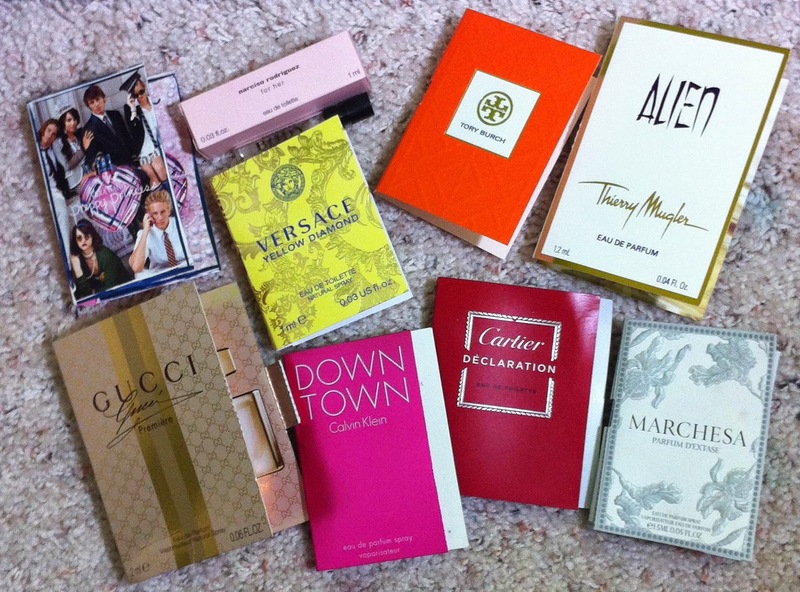 Discovering new fragrances is so fun! I have tried and love Burberry Body,only sample though....(sad face). I have also smelled the Alien and it is alright. One of my favorite perfumes and I hope to get a bottle one day is Prada Candy. Is is one of the few I can wear most any day! i'll have to find gucci premiere to try, it sounds like a really interesting mixture of notes! i could not get into Alien though. it smells like old, dirty towels to me at first spray. it does last forever though, and the dry down is actually smells fine. kind of weird. Your description of Alien made me laugh. I find it interesting that certain fragrances smell awesome to some people and horrible to others. And how some smell awesome ON some people and horrible on others. It's all chemistry, I guess.